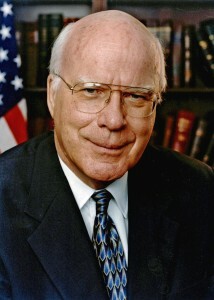 Patrick Leahy of Middlesex was elected to the United States Senate in 1974 and remains the only Democrat elected to this office from Vermont. At 34, he was the youngest U.S. Senator ever to be elected from the Green Mountain State. Leahy was born in Montpelier and grew up across from the Statehouse. A graduate of Saint Michael’s College in Colchester (1961), he received his Juris Doctor from Georgetown University Law Center (1964). He served for eight years as State’s Attorney in Chittenden County. He gained a national reputation for his law enforcement activities and was selected (1974) as one of three outstanding prosecutors in the United States. Leahy is the Chairman of theSenate Judiciary Committee and is a senior member of the Agriculture andAppropriations Committees. He ranks first in seniority in the Senate and is the President Pro Tempore. As the senior member of the Appropriations Committee, Leahy is the Chairman of the Committee’s Subcommittee on State and Foreign Operations. In the immediate aftermath of the terrorist attacks of September 11, Leahy headed the Senate’s negotiations on the 2001 anti-terrorism bill, the USA PATRIOT Act. He added checks and balances to the bill to protect civil liberties, as well as provisions which he authored to triple staffing along the U.S.-Canada border, to authorize domestic preparedness grants to states, and to facilitate the hiring of new FBI translators. Leahy’s Judiciary Committee investigation into the mass firings of U.S. Attorneys and of White House attempts to exert political influence over the Justice Department led in 2008 to the resignation of Attorney General Alberto Gonzales and the Department’s entire top rank of political appointees. Leahy is the chief sponsor of the Innocence Protection Act, which addresses flaws in the administration of capital punishment. Parts of Leahy’s death penalty reform package, which were enacted in 2004, will reduce the risks that innocent people are executed by providing for post-conviction DNA testing and better access to competent legal counsel. A leader on Internet and technology issues, Leahy was one of the first members of Congress to go online and in 1995 was the second senator to post a homepage. His website consistently has been judged one of the Senate’s best and a leading Internet magazine called Leahy the most “Net-friendly” member of Congress. He has been the Senate’s leading champion of open government and of the Freedom of Information Act (FOIA) and in 1996 was installed in the FOIA Hall of Fame in recognition of his efforts. He is one of only two politicians ever awarded the John Peter Zenger Press Freedom Award. Leahy has crusaded for the protection of privacy rights, copyright protections and freedom of speech on the Internet. He was a co-founder and remains a co-chair of the Congressional Internet Caucus. Leahy has taken the lead on several important privacy issues, including drafting legislation to address data privacy and security and leading the effort to enact privacy safeguards for electronic health records. Always ranked among the top environmental legislators by the nation’s foremost conservation organizations, Leahy successfully opposed attempts to allow oil and gas exploration in wildlife refuges in the United States, including the Arctic National Wildlife Refuge in Alaska and the Missisquoi Wildlife Refuge in Vermont. Leahy has also helped secure more than $70 million in federal funds to clean up Lake Champlain and has spearheaded congressional efforts to tackle the dangers of mercury pollution. He has worked to add more than 125,000 acres to the Green Mountain National Forest, an accomplishment matched by few lawmakers of any era. Leahy has led bipartisan efforts to streamline the Department of Agriculture, and the 1994 Leahy-Lugar bill reorganized the U.S. Department of Agriculture by closing 1100 offices and saving more than $2 billion. Leahy also led the successful effort to extend the Conservation Reserve Program, which assists farmers in meeting environmental objectives without reducing income. Leahy’s Farms for the Future program — now the Farmland Protection Program, which was created in the 1990 Farm Bill — has helped preserve more than 350 Vermont farms. He played a crucial role in enactment and implementation of the Northeast Interstate Dairy Compact and also worked with others in the Vermont Congressional Delegation in establishing the Milk Income Loss Compensation (MILC) program, modeled on the Compact. Leahy also is the father of the national organic standards and labeling program, which took effect in October 2002.